Sometimes it’s filled with feet. If you’ve never done an author visit at a school or library, it can seem a bit scary. Being prepared helps boost your confidence. Remember the old cartoon Felix the Cat? Whenever he got in a fix, he’d reach right into his bag of tricks! A bag of tricks is good for authors to have on hand for public speaking, no matter what age you’re addressing. In the last two posts, we covered tips for reading aloud and props for school visits. Basically, props are part of your bag of tricks, whether large or small. You can use them as an ice breaker or throughout your presentation. When you schedule a visit, be sure to ask how much time you’ll have and what ages you’re dealing with. If you’re going to talk about writing in addition to reading excerpts of your book and sharing a little about your personal journey, ask if there’s a certain topic they want you to cover, such as plot, figurative language, the importance of reading, etc. That will help you prepare ahead of time. Usually I’m free to discuss whatever I want, though. So, what should you talk about? Introduce yourself. Explain what genres you write and what ages your write for. If you use the word “genre,” ask the kids if they know what it means. Share a little about your writing journey. If you did a lot of research, explain how you researched your book. Engage your audience by asking questions. 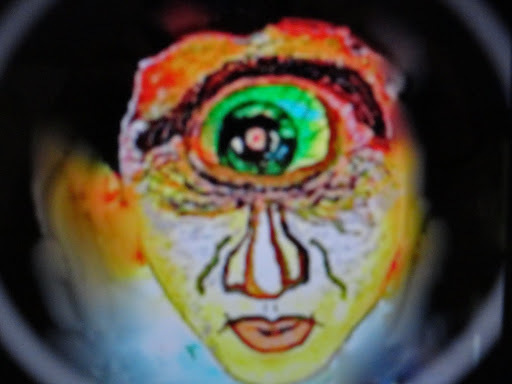 (Before I read my short story “Cyclops Clyde,” I ask if anyone has had their computer do weird things. There’s always a show of hands. Then I explain how my computer does so many strange things, I think it’s haunted, so one day I wrote about a monster that lives in it. After I read it (with tons of animation and drama), I tell them they can write their own computer-monster story. Here’s a picture of that one-eyed monster! “What are you afraid of?” or ask them about anything that ties in with your theme or story. Have backup material in case you’re there longer than planned. If your book is about animals, have a list of interesting and amazing animal facts. If you wrote a historical piece, have extra trivia about that time period handy to share. You can ask the kids if they think they would have liked to live back then. If you write sci-fi, you can come up with all kinds of cool questions to engage your audience. Teachers love it when you talk about how important it is to revise. Jaws drop when I tell the kids some of my books were revised 50 times. Toward the end of the session, allow time for questions. You’ll probably be asked, “How much money do you make?” Kids have a misconception that authors are rich. Unfortunately, I have to break the news to them that it’s difficult to make a living as a writer but that the market is better for nonfiction than fiction. (I always ask if they know the difference.) It’s important for people to know that authors write because they love to write, not because they plan to get rich. For more great tips, check out Heather Kelly’s June 1st post. It’s all about author Jackie Davies and the wonderful presentation she does at readings. She uses props, reads short, entertaining excerpts, and interacts with the kids. You can also view her two very cool book trailers. How Do You Schedule a School Visit? After reading the last post, Kristen commented that she’d like to see a post on how to schedule an author visit. I don’t know how other authors set up school visits, but from my experience, you usually need a referral. Most schools aren’t open to just anyone visiting their campus, so you’ll need some kind of connection. And many teachers are required to pack so much into each day’s curriculum that they’re not really open to having guest speakers. My co-authors (Kathy Sant & Maria Toth) and I put out the word to family members and friends that if they know any teachers or librarians who wanted us to do an author visit, to let us know. We provided business cards and/or a flyer with our bios and website. Unfortunately, the schools are short on money and most can’t afford to pay authors right now, but they usually allow us to sell books (we don’t do high-pressure sales), and we let the kids and teachers know who the school contact is for orders and also what bookstores carry our books. Once you start doing visits, word of mouth is your best advertising, and you’ll start receiving invitations not only for school visits, but all kinds of community events. The first week in March, most schools hold a Read Across America celebration in honor of Dr. Seuss’s birthday, so that’s your best time to set up an author visit because the schools are looking for guest readers to visit each classroom. No, you don’t have to read a Dr. Seuss book. My co-authors and I prefer 4th through 6th grade classrooms, and we read excerpts from our scary stories. If you have a Cat in the Hat hat, wear it for Dr. Seuss week! It’s your call as to how much time and energy you want to invest in author visits. I’m more likely to return to the places where I felt appreciated and received a warm welcome. I average about one author visit per month so that’s quite doable for me. Here’s one of my favorite incidents during an author visit. I had lots of props set out for visual aids. 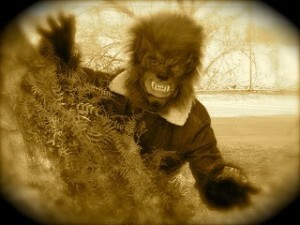 A class of 4th graders were dying to see me put the werewolf mask on. “Are you sure it won’t be too scary for you?” I asked. “Noooooo,” they all chimed in. They got antsy with anticipation and assured me they could handle it. “Okay, then . . . get ready. . .” I whipped the mask away from my face, raised my arms and hollered “RRRRAH!” while barely jumping in my seat. It startled them silly, and they loved it. Their reactions were priceless. So, I pulled that trick on some of the other classes and got the same great responses. Even the teachers cracked up. You learn something new each time. I’m looking forward to many more adventures doing author visits. Some of you might have other ways to connect with schools. If you do author visits, how do you go about booking them? 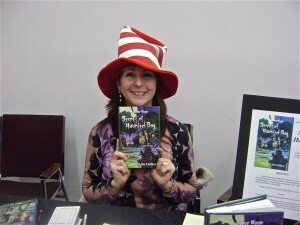 Wub2Write, These are EXCELLENT tips for authors to get bookings for school visits. Thanks so much. Oops… forgot to mention that by volunteering with Reading Buddies, I was hired to do 3 school assemblies and invited to speak at a "Young Author's Round Table." Though, this was before the recession and budget cuts. Even so, doing an assembly at no charge is good practice. I've done an assembly for free and enjoyed it. Anytime we can share our love of reading and writing is a good day! Great information, Lynn. Thanks so much. More good info, Wub2Write. Thanks for all that.Stephanie, You're welcome. Soon you'll be sharing all that wonderful info about Nubia with school kids. The costume you're making will be a perfect prop to take with you! I hope that museum still carries the anklet with bells. That will be an awesome prop, too. I love your tips for class visits! It sounds like the kids have a blast. More great tips! I especially like the tip about asking the kids if they understand the words you're using (like genre). Sometimes we can forget they may not be familiar with certain terms. Thanks, Julie. I try to make it as much fun as possible for the kids, and I have a blast.Lynda, yes, I like to teach the kids new words if the opportunity is there. Another good word is pseudonym, or pen name. Mark Twain is a great example to use. I learn a lot from the kids, too! Whoa – look how tv used to be in those days! Hasn't animation come far? Great post!PS – I can't see the book trailers you mentioned? I don't have any school visits on tap, although I have a couple copies of my book at my high school. There is a bit of mild swearing and eleven murders, some of them gruesome, so I don't think I'll be doing any readings to elementary schools LOL! But great blog today! Hi D.U. – Yes, so many changes in animation since 1959! I sent you an email with the link to those book trailers, but the link to them is on Heather Kelly's site. Her post is related to my author visit posts, so it's worth skipping over there to read it.Stephen, nope, probably not a story to read to elementary schools, even though some of the kids would want to hear the gory stuff. You're a good candidate for visiting high schools, though. Great tips! I haven't had a chance to speak to schools but I'm a former teacher so I think that will help – a lot! Hi Tali. Yes, you can use any of these tips to fit your own style and audience. Have fun!Laura, As a former teacher, you're at an advantage for author visits. You'll be a natural at it, And also being a mom helps you know what kids will be interested in. I always consider whether my own kids, nieces & nephews would like something and go with that. Haha! Thanks, Nutschell. I love donuts! Wonderful post, Lyn! As a former Elementary School Teacher, I loved author visits. Books are the core of a good education and a bright future. (I hope one day I can go on my own author visits. )Something one author did for our students was he signed a little note on paper and gave us permission to print it off for all the students. So many kids can't afford to buy the books that the author offers…so this was an amazing gesture for my low income kiddos… Barry Rudner will always hold a special place in my heart! My last school visit I had so many questions from the teens that I barely made it through my "superb" slide show! Actually, their interaction was so much more interesting than what I'd set up that I skipped the presentation and just talked with them. Wonderful experience.Thanks for sharing all you've learned. Very nice. Hi Charmaine, Nice to meet you. You're right, it's good for teachers to get the kids pumped up about reading, too. And parents, and grandparents, uncles, aunts! We could go on and on. It does make a difference in a kids' life when all their role models love reading. Thank you, Talei. Felix the Cat cracks me up. So does the Cat in the Hat!Thank you, Lee. That's fantastic that the teens were so interested in your visit that they kept asking questions. You're a big hit and are obviously filling a need. Yay for you doing high school visits! Lynn–thank you for linking to my post! I hope some day I'll have my own experience to draw from!! I'm loving watching your blog evolve and change–it's awesome over here!! Lynn–I would love to email you, but don't see your email under your profile. Or, do you tweet? You can email me (hegkelly at gmail dot com) and then I would have your email! Visiting to return a comment! I wish we had authors who wanted to visit my school. Our librarian has tried but let's just say the last one (2 years ago) didn't work out too well. She was awesome, the kids not so much. Hello Heather! Thank you. My pleasure to add your link. That's an excellent post that ties right in with my post. I sent you an email.Thanks for stopping by, Alleged Author. Some of the schools I've visited never had an author before. That makes it extra-special for me! Wow this was so helpful! Though I'm not near that part of the experience in this whole writing process but this is so great to bookmark!!! Thanks, Jen, for visiting my blog. It's never too soon to start planning. Also, you don't have to be published to do school visits. Good luck to you! Thanks for the nice comment and also for recommending my blog to Rhonda. I have a couple of great posts coming in the next few days–I just have to finish final exams and grading papers. Did you finish the final yet? I am already halfway through another course (this one is on WordPress) and need to catch up on my assignments.Your blog is looking better and better each time I visit!